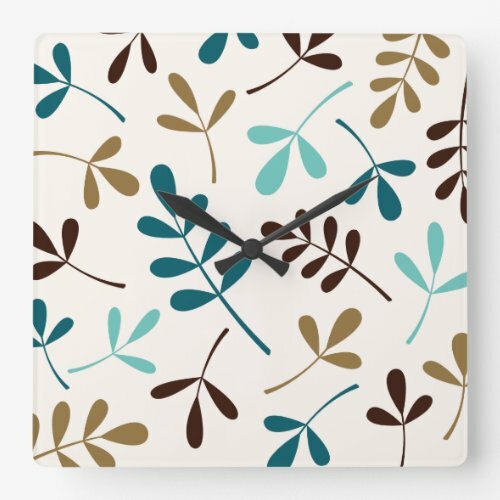 Teal Wall Clocks - Oh Teal! 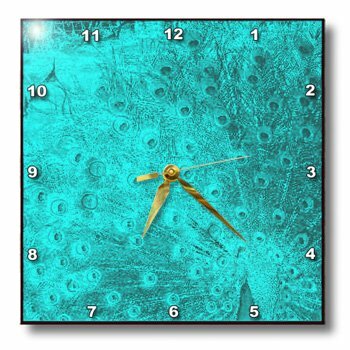 Most people need or want a time-piece in a room and these gorgeous teal wall clocks are ideal in a teal themed room. 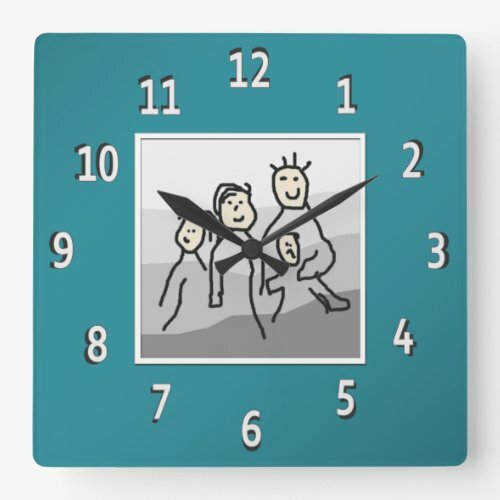 Here you will find a selection of modern wall clocks both cool square ones and round ones. These will go well in any room in the house. This page complements our other pages in Teal Home Decor series. Be sure to check them out for matching tips and color coordination. Scroll through to enjoy our choices and enjoy this online shopping experience. This square wall clock measures ten inches by ten inches. It has a stunning picture of turquoise flowers that will look great in your teal colored kitchen. Works with a battery. 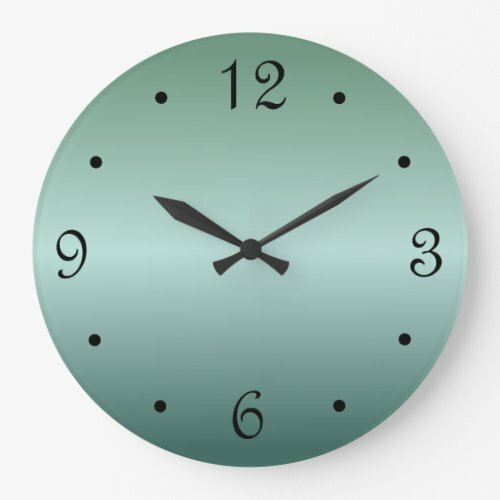 Another stunning clock in teal. The high gloss finish looks like ceramic and is perfect for the kitchen. It measures ten inches by 10 inches. The perfect gift. 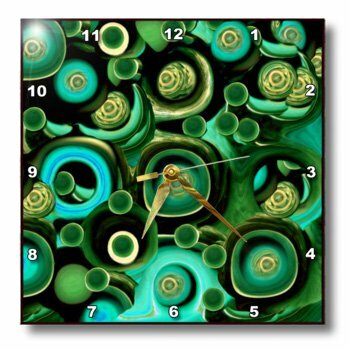 This 10 inch by 10 inch wall clock come in fractal like tones of green and teal. Handcrafted, the face has a high gloss finish. The mounting hook makes it easy to hang in your teal room. One of the cool things you can do now is get a lot of gifts personalized with your own images or text. 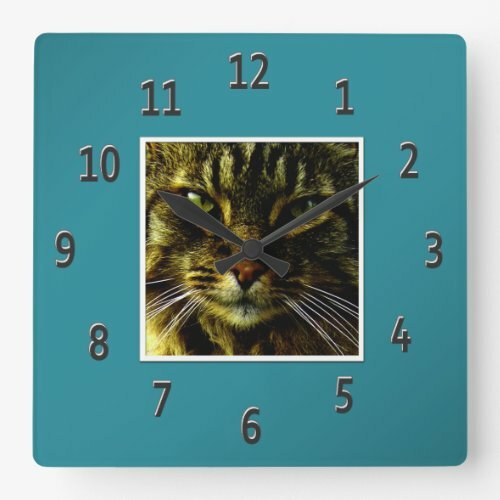 Zazzle is a site that offers this service on designs from their many artists and shops. 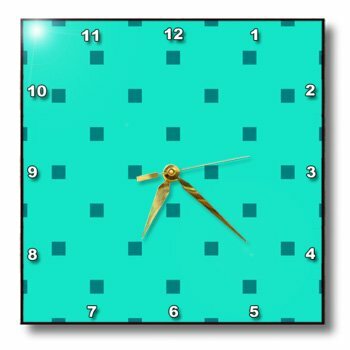 Here is a small selection of teal wall clocks from Zazzle. As you can see, they offer more styles and shapes than the clocks shown above. To get more details, measurements and how you can personalize them, click through the links. What is the Color Teal? If you asked someone the question “What is the color teal?”, it may be described as close to an aqua color, or perhaps something similar to a turquoise color. Teal is actually a medium to dark bluish green color with low saturation. Teal works well when used with colors such as brown and coral. For the teal with brown combination, think of examples in nature such as the sandy colored beach and the teal shade of the ocean water. For the teal and coral combination, think of Native American jewelry pieces featuring turquoise stones in shades of teal along with coral colored stones. Teal is a popular color choice to use on stucco homes and this color can often times be found as the exterior color for many homes in areas such as Florida and Arizona. Many times teal is used with other colors in items with a Southwestern theme. When thinking of the color teal, several words come to mind. These include fresh, cheerful, happy, inviting, and lively. This makes teal a good choice for use in home decor, as it evokes pleasant thoughts in most people. Teal makes people think about a warm summer day at the beach, or perhaps vacationing in a tropical paradise. This color is also a great choice for decorating a baby’s nursery if unsure of the gender. The color is blue enough to be used for a baby boy, yet still neutral enough that it would also work well for a baby girl’s room. Teal is a color that reminds us of nature and that just has a way of making people feel happy. It is a color that can be associated with comfort and pleasant memories. Because of teal containing both the colors blue and green, it also makes it easy to incorporate it into color schemes using various shades of these two colors. Teal is very versatile and makes a great decorating choice. Most people need or want a time-piece in a room and these gorgeous teal wall clocks are ideal in a teal themed room. 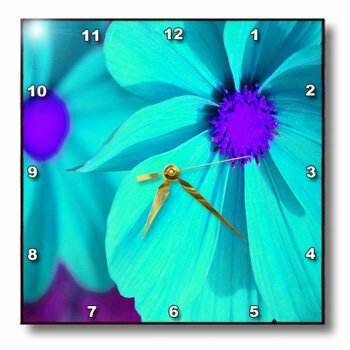 Here you will find a selection of modern wall clocks both cool square ones and round ones. These will go well in any room in the house.